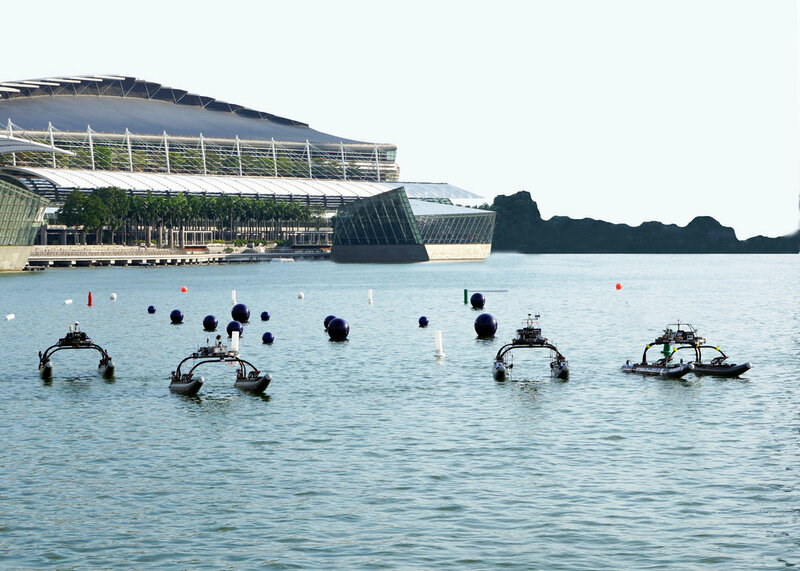 The Wave Adaptive Modular Vessel (WAM-V) is an innovative class of watercraft (both autonomous and manned) using unique suspension technology to radically improve seagoing capabilities. The articulating system uses springs, shocks and ball joints to minimize structural loading. 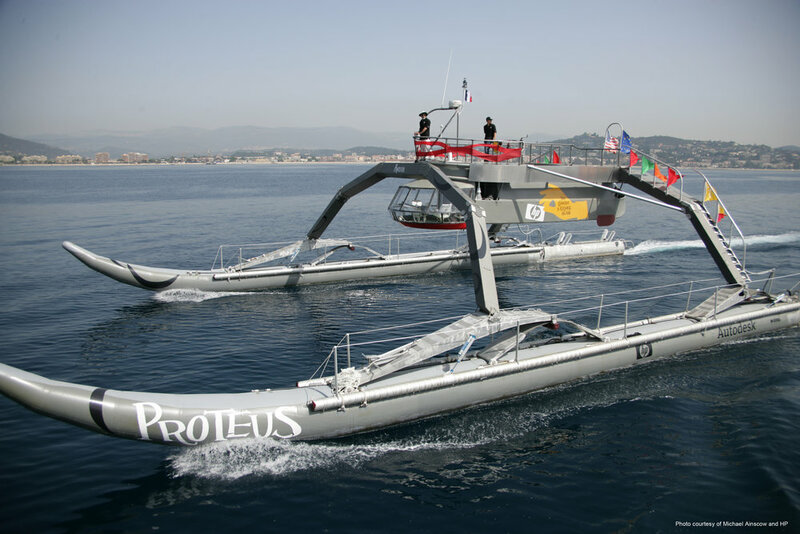 The result is an ULTRA-LIGHT, MODULAR vessel that can perform in sea conditions where an ordinary boat of similar size could no longer operate. The incredibly SHALLOW DRAFT and arches contribute to the GANTRY CRANE functionality. Unlike conventional boats, the WAM-V's flexible structure adapts and conforms to the surface of the water resulting in an exceptionally SMOOTH and LEVEL platform. Inflatable pontoons help absorb motion and force. Two engine pods are hinged to the hulls which keep the propellers in the water at all times, further improving vehicle stability and controllability. The 2:1 length-to-beam ratio, along with the articulating suspension systems, makes the WAM-V an exceptionally MANEUVERABLE and STABLE vessel. As sea-states worsen, excessive pitch and roll quickly limits a conventional boat's ability to gather data. Compared to similarly-sized monohulls and rigid cats, a WAM-V experiences REDUCED PITCH and ROLL so sensors and instruments continue to function across a wider range of environments for INCREASED DATA-CAPTURE. The WAM-V design works on many scales and can be designed and built to match specific applications. Marine Advanced Robotics, Inc. has designed, tested, manufactured and delivered WAM-V USVs in lengths of 8', 12’, 14’, 16’, and 33’ along with a 50’ POF (proof of feasibility) and the 100' prototype Proteus. Air, sea and subsea capability from one autonomous surface platform. WAM-V sub-assemblies use STANDARDIZED QUICK CONNECT INTERFACES for rapid assembly, disassembly, component replacement, or reconfiguring and future upgrades. Payload packages and instrument packages can be swapped in minutes. Propulsion systems can be reconfigured by changing engine pods. WAM-Vs are easily and economically shipped via land, air, or sea. The modular design quickly reduces in size for storage or shipment. Optional folding features reduce the footprint by as much as 75%. The WAM-V 33 (33' long x 16' beam) hydraulically folds down to (16' x 8') to fit in a standard 20’ ISO shipping container. A 20' container can also hold four(4) WAM-V 16 (pictured below). Only one(1) conventional 18' RIB fits inside the same container and must first be deflated. 4 WAM-Vs or 1 RIB?